U.S. rock musician Lanny Cordola has founded a guitar school for street children in Afghanistan. 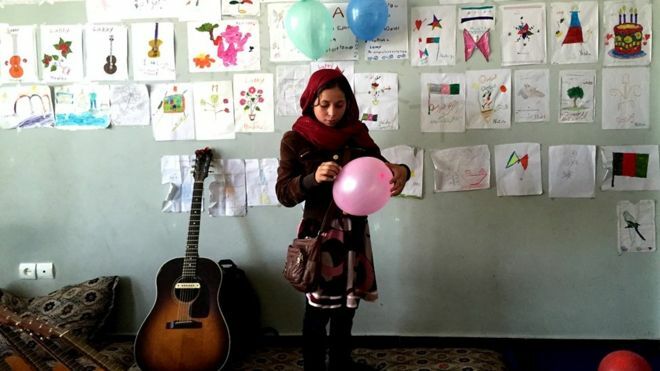 Cordola, who is from Los Angeles, was inspired to start “The Miraculous Love Kids” guitar school in Kabul after learning the stories of Parwana and Khorshid, two sisters who were killed in a suicide attack in September 2012. “I never ever thought of coming to Afghanistan, but two years ago I came here to meet the family of Parwana and Khorshid,” Cordola said. Four months after the visit, Cordola returned to Afghanistan to start a guitar school for street children with the larger vision of allowing the children to travel and tell their stories through song. The guitar school serves about 50 children and provides a place to heal from tragedy. One student, Mursal, was just seven years old when she lost her two older sisters Parwana and Khorshid during the suicide attack. Mursal, now 12, attends the guitar school and describes it as a life-changing experience. “It was some years after the death of Parwana and Khorshid. We went to a restaurant and they told me, ‘this is Mr Lanny’. He gave me a guitar and now that I started learning to play and sing, it has changed my life and opened a new world,” Marsul said. Marsul dreams of becoming a teacher and to “teach guitar to all the girls in the world” in order to create a peaceful future. The children at The Miraculous Love Kids guitar school have been playing informally around Kabul and are beginning to receive invites to play at concerts.